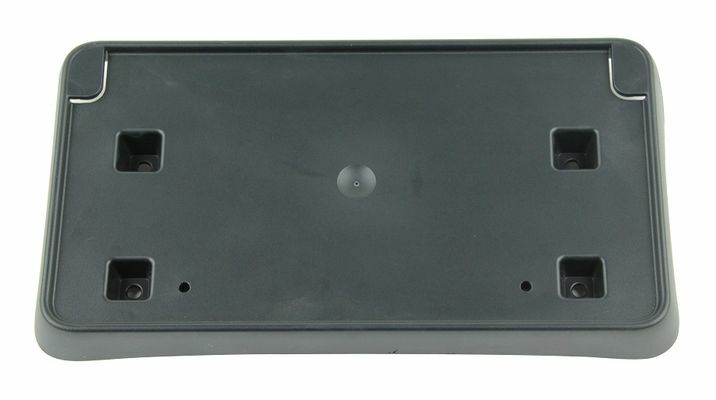 Mopar factory front license plate bracket for the 2014-2016* Laredo, Limited, Overland and Summit Grand Cherokee models. Please select your bracket above. Will not fit the SRT8 or the 2016 75th Anniversary Edition models. I think my 2014 Jeep Grand Cherokee is beautifully designed and great quality throughout. Why it didn't come with this bracket as standard equipment is beyond me. This fits perfectly and was an easy install. ProsLooks much better than a bare plate. ConsRequired drilling holes into my new bumper. 6 screws and 6 minutes, you're done! This item fit perfectly and was easy to install. For some reason I was only able to use two screw holes to attach to my 2015 Overland. The bumper had no way of attaching bottom 2 screws. Nonetheless, I got it on and snug with the top two screws that match barely visible indents in the front bumper. Just had to force the screws through. The installation instructions with the plate holder were fairly useless and probably based on a 2013 or 2014 model. ProsLooks good and fits solidly. ConsNot that easy to install. Poor installation instructions. Perfect fit and easy install,,be sure to READ the instructions and drill the correct holes. ProsThis appears to be a factory designed part and fits nicely..
ConsDealer should have included in the purchase of the vehicle . His excuse was that Jeep did not offer a brkt. My comment is how did I find it in 2 minutes on Just 4 Jeeps website AND it has a MOPAR part number. High quality, great fit, easy to mount, thanks! Ordered this for my 2015 Jeep Grand Cherokee. Bought in Kentucky (no front license plate required) but live in Ohio (front license plate required. Received Quickly. Came with easy-to-use instructions. I had to drill small starter holes in my bumper but couldn't have been easier! ProsClear instructions. Even a caveman could install. Bracket was a perfect fit for our 2015 Jeep Grand Cherokee. Interestingly, our dealer did not have a bracket that would fit and said we needed to use nylon bushings and screws. Thank you Just for Jeeps. ProsVery simple item to install. ConsPlate face is a little bigger than any standard plate but not noticeable after installation. Fit my 2014 Jeep Summit without issue. Shame that front plates are required here in NH as the most disappointing part of owning my new Jeep was when I had to push the 4 screws through my shiny new bumper. There were two dimples on the bumper for the upper screws but the bottom ones needed a quick tap to ensure they didn't veer off in the wrong direction. Just received this today and it is exactly what I expected. It mounts with 4 screws (provided) and is precisely contoured to make an exact, snug fit. The only bad part is having to pay just short of $30 for something I feel should be standard equipment.